Amherst Sour Diesel is a cannabis seed whose origins are kept a secret. This wonderful vigorous marijuana plant will reward your work with large, elongated, compact buds complemented by a rich complex aroma. Indoors it performs best with a short growth and outdoors, in temperate, warm, dry and Mediterranean climates or in a greenhouse. A marijuana plant that boasts balanced properties. The aroma of this cannabis hybrid is a pleasant combination of ripe fruit and oil. The flavour is rich and complex, with hints of tropical fruit, oil and exotic wood. The effect, typically Sativa, is euphoric, uplifting, powerful and long-lasting. A cannabis strain Sativa lovers will know how to appreciate. I purchased a 3 pack for outdoor grow from April to late October, I had 8' plants with buds the size of bananas. I was extremely happy with this strain and looking forward to my next grow in the upcoming months. I received a free bean from The Attitude. Very strong effect. A little bat hit and you are off and running. Excellent taste. Very compact bud structure. Excellent for getting work done. Gave me major paranoia in a public setting. At home, working in the garage, yard, painting, physical tasks, this ganja rocks. Wouldn't clone though. It was a sad day I used up the last of it. Amazing Strain. Absolutely wonderful. It truly does double in size in flower. I started this strain 2.5 weeks behind Oregon Diesel, and by the time I flipped the lights the Humboldt had almost caught the Oregon Diesel in size. This strain is vigorous and flowers fairly quiclkly compared to its suggested 9-10 weeks. I’ll be checking the trichome colors but wow do I wish I got these seeds going at the same time... if I could have topped these they would even bushier right now. The buds look exactly like the picture, they’re like a muffin top rather than a cone, and dense up extrmely fat!!! Very sticky, very smelly stuff. This stuff is super potent, but I didn't love the flavors I got from it quite as much as some other HSO strains i've grown (mainly Choc Mint OG being my favorite flavor profile). Very piney, and lemony. Great trich coverage though - definitely more of a day time jittery high than a couch lock in my experience. Easy to grow, very resistent and very nice looking. These are strong genetics. Grower's Point Of View: This strain is very tough and forgiving for a learning grower. These came free with a Blue Dream order, and it outperformed Blue Dream when put under the stress of my being a noob grower. While I never did get a good harvest from the Blue Dream seeds I received, I always got good results from the Amherst Sour Diesel while giving both the same conditions and nutrients. I'm a better grower now, and when I get the money one day, I'd like to give the Blue Dream a shot again. But if you are looking for an easy to grow strain, this one can handle a lot of stress and bounce back from pretty bad grower mistakes as long as its in veg or early flower stage. She also produces a respectable yield every time even if you stress her in flower. High Quality: She has a very nice brainstorm/rushing thoughts effect on me that I can use to come up with new ideas very quickly, which I like in a sativa. It also has a rush effect ,if you have a good amount, and will make your heart race during the peak, which can be freaky at first but I actually enjoy it. It also has a good euphoria effect. You don't need a lot with this strain to get a good buzz and the buds can be very frosty, sticky, dense and aromatic. She is like a cup of coffee as long as you don't overindulge, and I sometimes get very energetic on it from the energy boost, which can up productivity when doing monotonous chores, and can enhance other activities as well :) She makes tasty rosin as well, which is my preferred way to enjoy it. Recommended on both accounts! Very interesting plant, I grow it mainlining way, now it starts blooming, Im really curious how it will smell and taste.. same I got mango sapphire, but this one should be really thc high.. so I am very curious. Amazing strain, super flavorful and the buzz is definally exceptional, however the pheno I got was defiantly more sour diesel. I am growing the Amherst sour diesel, under an 800watt lamp, this is LED technology so it doesn't actually use 800W, phew. But it emits as much light as an 800watt, distance between plant and lamp 45.7 cm, light concentration received is 494umol/m²/s. The leaves are astounding, very dark green, the plant grows very densely, and wide aswell. If you train this plant humongous yields are possible, watch out for your humidity they dont seem to take it that well. I am No expert, i just love weed, im from Amsterdam, and I want you to smoke great bud like this. Roll up! Growing, so far it is a success! Very resistant and easy to train! This strain is awesome to grow and easy to cultivate. During veg she showed steady even growth topped her at 7inch flipped her at 9 and by week 5 I had fat and some of the most resinous bud I have ever seen. She finished at 10 and a half weeks ultra fat and sticky with amazing flavours. Seriously hard hitting well done guys. Beautiful plant with rock hard nugs, great producer.superb taste and potency too!! this strain has dense nugs and the smell is like gas but better. medium producer but i only grew it for 4-5 weeks before flowering it. nothing special done to her. awesome strain that i am growing again to take clones. Maybe the most prolific strain in the greenhouse this year. It is a multi-stage harvest plant outdoors, producing a layer of big fat mature buds that need to be harvested a bit early followed by a more uniform beautiful layer. Buds are dense, cure and dry well, and were mold resistant. It is more uplifting than a pure indica but I don't find it to have a strong sativa effect. I did grow past just milky and to some amber trichomes, which can emphasize the indica aspects. Delicious smoke, smells great, and the big dense buds look real nice in a big jar like a dispensary would have. First harvest is quite early, final takes a bit longer but it's not too bad at all. I received this as a freebie from Seedsman. When another seed did not germinate I threw this in a pot and managed to get it above ground right before flip. Now it’s hands down the stinkiest in the garden. I’m about a week away from chop and can’t wait to try it. Great plant. Very potent. Had bud root, but environment wasn't perfect. Big buds, nice smell and taste . Not for casual smokers. I am giving her another grow in better environment. If you after potent sativa look no further. I smoke for 22 years and I love this strain for its potency. We grew eight Amherst Sour diesel alongside eight seeds from another company the asd completely outperformed them in every way I was really impressed with the size and potency of the buds. unfortunately even with carbon filters it proved to potent as it was smelling in the street so we had to cut down early but I would definitely grow again given the chance. Sour and diesel is what I expected and that is exactly what you get, but more! Its got a unique taste and looks so good frosty nugs. Easy to care for and not much trimming needed, so its perfect to try for a first time. Would recommend to anyone and has wowed everyone who tried it! 5 STAR RATED. A BIG PRODUCER. THIS GREW BETTER THAN THE FROSTY PICTURE SHOWN. I WANT TO POST PICS. INCREDIBLE FROST!!! PLEASE LET ME POST 3 PICS. LOTS OF PURPLE AND PINKS IN MY COOLER BASEMENT. WICKED BAG APPEAL. BETTER YIELD THAN ANY OF THE OTHER 10 STRAINS I GREW NEXT TO IT. BIG PROPS TO HUMBOLDT!! This "little" lady will shock even the most experienced of growers whove yet to taste, and even those that have like myself just keep coming back for the exquisite and unmistakable Flavours, my most recent simply stank the room out during veg of passionfruit to the point I even disconnected my carbon filter just to have the entire house smell of it... ladies and gentlemen if you are looking for a show stopping plant that's an absolute joy to cultivate? look no further than Amherst Sour Diesel. Got one of these free with a purchase. It stretched and went all leggy only producing small buds with huge spacings. On a more positive note it is a lovely sour smoke and hits you straight away and gives a long and very pleasurable high and is a a fantastic painkiller. The buds, though very small, really swelled with very round calxyes frosted with white sparkly trichromes. The smell is more vegetal and inconspicuous but the smoke is sour and tangy, like a sour candy but smooth and very pleasant. I purchased Amherst SD , Lemon Garlic, and Chem D . This was a grow gorrila style . The area where they all where planted was grown up and had poor dirt mixed with horse manure. The only fertilizer used was a bloom booster during flowing . It was a humid wet summer heavy dews . This is what happend. I planted the SD with the Lemon G , Chem Dog , and a KC brains NL . At First it looked like the NL and SD was gonna race with each other up until first of July then the SD took off like a jet . It got tall about 11 ft I didn't top any of them . She started putting on flowers and came on strong , buds everywhere . After she finished out I cut her down the buds smelt amazing with a lemon fuel type smell with some fruit like undertones. Manicurein her wasn't bad lots of bud to leaf ratio . 1 plant totaled 14 oz of sticky high quality bud grown from sees to finish first of October in a gorrila grow the dirt was poor and the place where she was at wasn't the sunniest eather . The smoke is smoth and uplifting and taste well the buzz is a head first with some body stone with energy but beware to much and u get a couch lock feel . I'll be running this strand again next season. It handles stress well . got this strain for free with my purchase here and i'm extremely pleased with this plant. Extremely easy to grow and has fairly high thc. This strain has an amazing woody taste and a huge yield, i grew this indoors in soil and got 500 grams on a 600w hps light. i recommend using scrog when growing this because the colas get extremely dense and heavy. will keep in my garden, one of the best diesels i have tasted. Many Canadians were introduced to the superior genetics of Northern California in the late 1970s, so embracing the great selection of seed varieties from Humboldt Seed Organization was an easy choice. The hardest part was making a selection. In the case of Amherst Sour Diesel, it's simply a solid performer indoors. The seeds were super viable, germinating quickly, followed by rapid, dense vegetative growth for 8 weeks in a rich composted soil supplemented with periodic fertilizations. Vegetative lighting was fairly intense, so the Amherst Sour Diesel responded with strong branching and fairly short inter-nodal stretch resulting in an absolutely gorgeous, dense, compact plant, with many side branches competing for canopy space at near the same height as the central spike - No need for pinching when given sufficient vegetative lighting as the canopy quickly filled with growing tips. To achieve such growth Amherst Sour Diesel was a healthy eater, responding well to a basic fertilizer regime using a slightly diluted 20-20-20 fertilizer with micronutrients during vegetation. 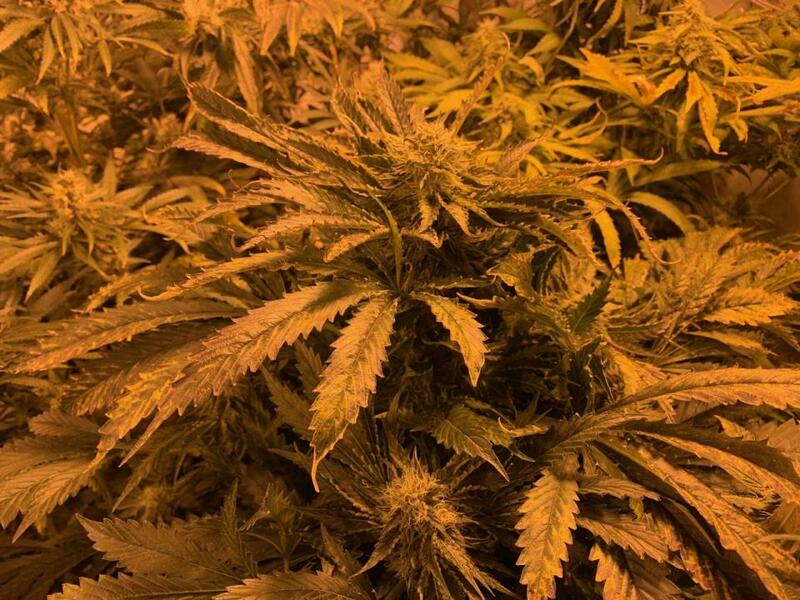 As the lights were dialed down to 12:12 the plant responded quickly into a beautiful stretch, with a thick canopy of tips reaching for the stars. Nitrogen was dialed back to only 7, as the plants clearly still needed some help during the first half of flowering, with P&K bumped to assist with rapid bud development. By the second week all nodes were bursting with fat, delicate clusters of creamy white pistils, and smaller leaves and calyx' covered with a white frost of glassy high stalked trichomes. A beautiful start. Dense flower development followed quickly, and by the 5th week the plant was heavy under the weight of well-developed rocket-shaped colas, dense calyx development, crystal caked. The plants finished in about 9 weeks with branches bent under the weight and volume of the impressive, sugar coated colas. 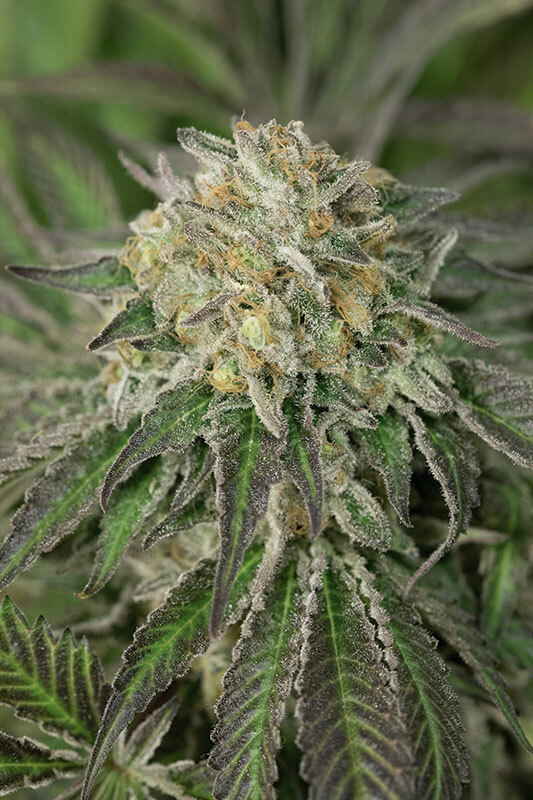 From the day the seeds sprouted, through all phases of growth, Amherst Sour Diesel was a delightfully rewarding and easy plant to grow, reacting very positively to every bit of love it received. and responding in turn with a spectacular harvest of fat, sweet and pungent buds. All in all, an excellent experience from Humboldt Seed Organization. Many thanks from your Northern friends. one of my favourite strains to date. to partake and to cultivate. from the day it sprouts til the day its medicine, this strain is truly magnificent. so far the phenos ive found are immensely strong and absolutely stink of almost over ripe fruit and oil and fresh cut wood. this strain is in its own league and is one i seriously recommend if you havent already tried it. beautiful is an understatement and you can expect some serious weight and growth early on in the flowering period, its almost spikey crown like buds are covered in resin and you get a lovely purple colour all over the flowers and leaves, lower stem nugs when cracked look like they have purple veins flowing through them. the best strain out there in my eyes! great work humboldt! this strain is show all the sign i want to see 3 weeks away from heavers. i do a 10 seed pheno hunt and i defiantly have 2 keepers thanks to brown guy 420 showing me the way forward to HSO. Sounds like a great strain . Sounds like it is a full , aromatic beauty . Just waiting for me to enjoy her wonderful properties and benefits . I bet she has a great terp. Profile . Looking that good she has too! Sour diesel is allways a great and easy grow, there's no way a beginner could not see this till harvest, it a sticky, stinky, frosty gas and new rubber smell too her , I run here at least once a year for other patients as for myself, thank you HUMBOLDT SEEDS and you guys and girls strains are just unfathomable,dopest genetics and strains,the HUMBOLDT SEEDS, too you and your staff and family members, HAPPY HOLIDAYS TOO YOU ALL !!! Amherst Sour Diesel was one of the first seed packs that I purchased from HSO, along with Chemdawg, Pineapple Skunk and EmDog. ASD vegs like a bumper crop, the growth is uniform and consistent. The flower it produces is the nice sour pungent smell that almost reminds me of the first time smelling cannabis. I momed out my favorite and she put off a few good rooms, I've moved on to try other strains since but Amherst Sour Diesel is definitely one that I'll be throwing back in rotation when I have room. Great job HSO crew! Thanks! High quality strain. Very easy growing plant, resistant to pest and disease. Can take all the nutes you can throw at her. Finished product is top notch, clear and uplifting, great for daytime use. All around great plant. Starting these for my next round. Hoping they come through as good as all the reviews. thank you HSO for being the best! Green crack 5 star strain. Great yield, super get stuff done smoke. I love hso, ordering more strains this time around for sure. Thanks hso for a great experience all around. Got 2 of these seeds as freebies from Seedsman at the beginning of the season and I have to say I was very impressed by this strain, extremely potent and resinous round buds with an amazing fuely flavor. The structure of this plant makes great yield a given if you top a lot and give it some support as the branches can reach pretty far making for a wide bush with nicely spaced buds that take light even pretty far down. Both plants came in at about 2m tall by 2.5m all around and yielded very nicely. I grew over 15 strains by many different breeders this outdoor season and the 3 HSO strains (Chocolate Mint OG, Lemon Kush Headband and Amherst Sour Diesel) most definitely came out on top, wish I had gotten more but at least now I know! This is strain for me.Strong,big yield,and unknown backround. I will order this strain because its strong backround of the unknown.Humbolt will be my only seedbank from now. Absolutely fantastic, love the smell & flavor. Perfect for night time and relaxing. Has a fruity yet diesel smell to them. Very fat dence kola when put into low stress training. Will definitely need trellis support for flowering. Buds becoming very heavy towards the end of flowering. Had amherst is my garden for 2 years now! Love it! Perfect evening high! The kolas on her are always dence and packed with trichomes. The best sour diesel i've ever had! Amherst S D is a winner! Got This bean through seedsupreme. It is currently about 40 days into flower, and it is looking amazing. My only regret is I didn't get more and raise an entire crop of this stuff. I have a good feeling that I will continue to grow this strain, I'm confident that it will be one of my favorites. From what I've read, this strain takes what is amazing about sour D and adds great potency and increases the length of the buzz. Can't wait to chop her down and cure her to perfection to truly enjoy this elite strain. Anybody looking for the real deal pungent gassy sour this 1 is for you.......so so gassy will get you in trouble..